The public park, as we still know it, was a nineteenth century invention. The aim was to give tired industrial workers an opportunity to enjoy fresh air, flowers and music – without being tempted by booze and girls in beer gardens. But times have changed. Most workers now spend most of their time in sedentary occupations. When they have spare time, they want exercise instead of rest. This is giving benches in public parks new uses. The photograph was taken on a hot day in Rome. Even the pigeon is going for a walk. This entry was posted in Public parks, Urban Design on 31st March 2010 by Tom Turner. Modern landscape architecture in ........? I attended a talk today by an Australian landscape architect who graduated in the UK 21 years ago. She now works for an Australian design company engaged in remote landscape design services, primarily conceptual design, for projects in Hong Kong and mainland China (including Chengdu and Beijing). The conceptual design was done in Australia and the detailed design in the Philippines. Then the drawings were sent to China and then translated. It is an amazingly global operation but in my opinion it could be the beginning of a tragedy. The styles used are a mix of ideas from Europe and America, which will make the appearance of China more like that of the west. There is a saying in the west which I like: ‘think global, act local’. I was sorry that the landscape architect had not visited mainland China and hope she will come one day to find out how more about Chinese culture. This is not a special problem caused by some specific people but the whole system such as the market , economy and something else, and therefore will not be solved quickly. But there are signs of a solution and Mr Yu Kongjian has made reference to “the rediscovery of Chinese cultural identity” problem. With its economic development, China is losing touch with five millennia of ancient identity. The Chinese classical garden is one of the world’s great garden making traditions. In China we are faced with developing a new tradition and a new style. It can be based on historic culture, natural topography and environmental studies of localization and contextualization issues. There are needs to develop China’s landscape education, landscape theory and landscape practice – with a historical perspective, cultural continuity and a perspective on the future of China’s landscape. This entry was posted in Asian gardens and landscapes on 26th March 2010 by Xiaomin. Vita Sackville-West was depressed by Hillary and Norgay’s ascent to the peak of Everest, believing that there should be places on earth untrod by human feet. How would she have liked the world’s tallest building, the Burj Khalifa in Dubai? 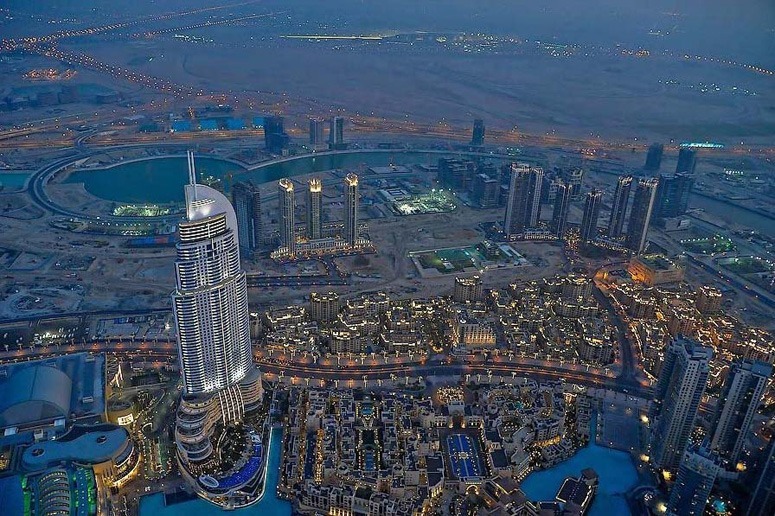 I am afraid that she would be horrified, although this Burj is by far Dubai’s most beautiful building, hopefully now distracting attention from the horrible Burj Arab Hotel. 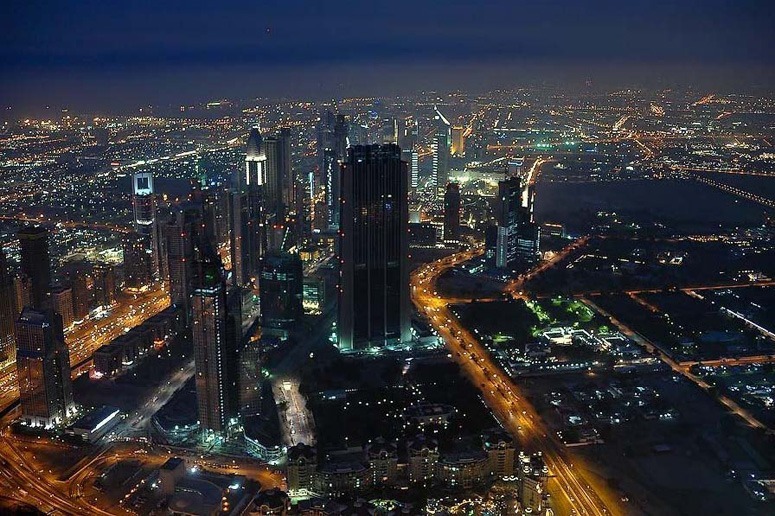 Many people would like to ask God if he regrets Dubai, but now that we can ride the 800 metres plus to the top of Burj Khalifa and look at it from His vantage point perhaps we can see that he might like it the way it is, by night at least. This entry was posted in Urban Design on 24th March 2010 by Lawrence. There is something endlessly fascinating about models of cities…Perhaps they enable us to relate to cities in ways that are normally not possible? Perhaps they give us a God’s eye view of the landscape and everyday life. So if we could play God for a day what would we say to those people down there that we created and who are now running around living their own lives in the various metropolis’ of the world? Or perhaps we would just make our own historical narrative films! Would we be tempted to move the pieces on the board? Re-arrange them slightly? Why would we want to do this? ….There is certainly something very appealing about the detailed scale models of street furniture produced for the city of Toronto! And of the very different in quality abstract garden model. This entry was posted in context-sensitive design, Garden Design, garden history, Landscape Architecture, landscape planning, public art, Sustainable design, Urban Design on 24th March 2010 by Christine. 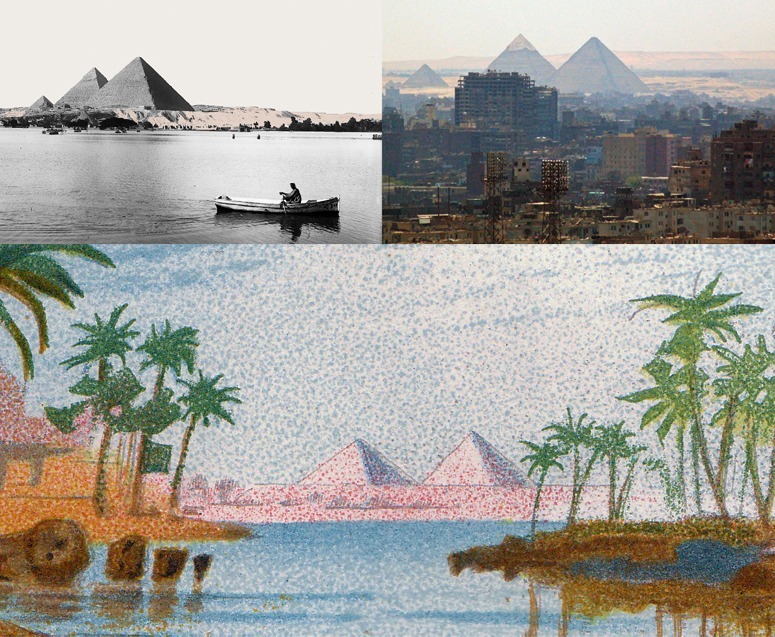 Here is (1) a nineteenth century painting of the Pyramids in time of flood [June and September – akhet – the inundation] (2) in an early twentieth century photograph (3) a recent after-the-dam photograph by trexcali. Were the climate change of the past 10,000 years to be repeated the River Nile would reclaim its flood plain. Egypt’s cities should have been built on the Red Land (desret), not on the Black Land (kemet) – and Egypt’s urban growth should still be on desert land, conserving what is left of one of best places on earth for agriculture, horticulture and garden design. This entry was posted in Asian gardens and landscapes, context-sensitive design on 21st March 2010 by Tom Turner. This entry was posted in Asian gardens and landscapes, context-sensitive design on 18th March 2010 by Tom Turner. Wither Chinese landscape and garden design in the twenty-first century? 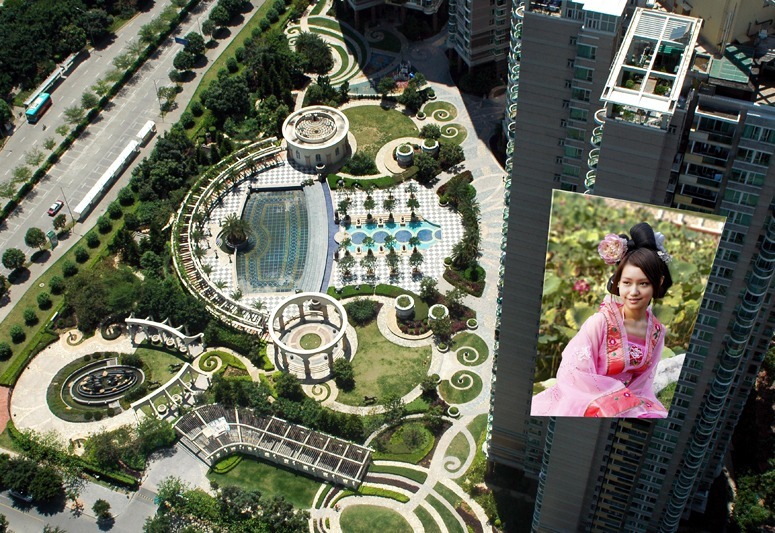 Where are garden design and landscape architecture in China heading? This entry was posted in Asian gardens and landscapes, context-sensitive design, Historic garden restoration, Urban Design on 18th March 2010 by Tom Turner. Without knowing too much about Masdar City, I am sceptical about Norman Foster’s proposals. So my suggestion is to develop a Masdar City Two with its focus on using a happy blend of traditional technology with as-little-as-necessary high technology. I would have David MacKay as the energy supremo and Hasan Fathy (had he not died in 1989) as the chief architect – and a landscape planner responsibile for the strategic direction of the new city. I guess there would be lots of mud walls, planting, and shade with excellent provision for cycling and electric floats for transport (as in Nanjing Street, Shanghai). All the roof space would be roof gardens with retractable awnings and limited vegetation supported by grey water. 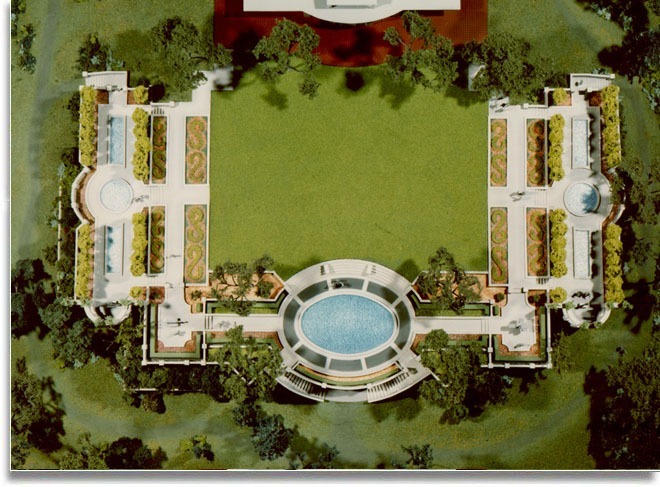 The gardens would be legendary – and related to the lost gardens of Ancient Mesopotamia. 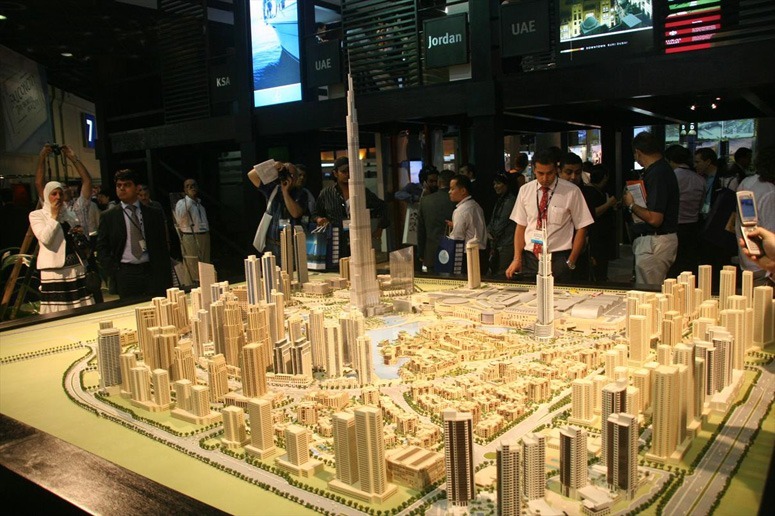 I think the result would be cheaper, better, more sustainable and more popular than Masdar City One. It might get less coverage in the architectural press but we could live with this. Sorry about the quality of the above photograph, taken in 1975. I went to re-take the photo 30 years later and could not find the place – I guess it has been destroyed. 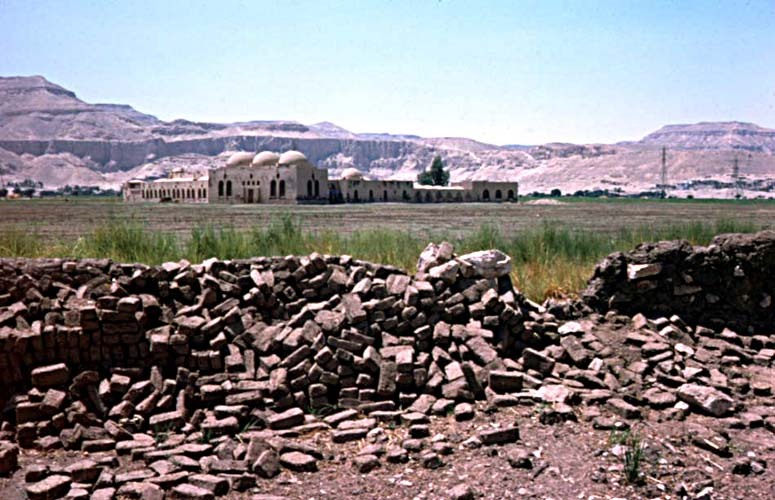 The residents of Old Gourna (or Kurna or Qurna) did not want to leave their homes amongst the tombs of the nobles, which had rich pickings and many tourists. Fathy was unpopular in Egypt but designed some beautiful and environmentally appropriate homes for Saudi princes. Odd that Iran should want nuclear power and Abu Dhabi should want solar power. What next? Will Iceland start making artificial snow? Or is Masdar City One really, as I will assume, an enlightened example of a rich country using its resources to develop technology which will benefit the world? The competition between Masdar City One and Masdar City Two would be very healthy and there should be a prize for the winning design team. Success would be judged from three criteria (1) construction costs (2) measures of sustainability (3) popularity with residents. This entry was posted in Asian gardens and landscapes, Cycle planning, Sustainable design, Sustainable Green Roofs on 14th March 2010 by Tom Turner. 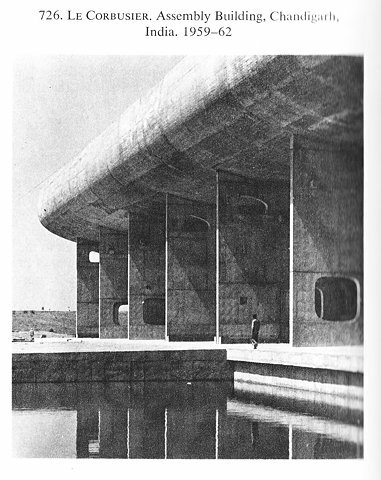 Corbusier is credited with the title of the Father of ‘Critical Regionalism’. 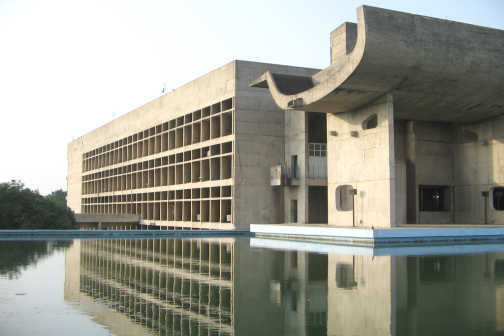 The Legislative Assembly Building in Chandigarh is said to typify his approach to design in this latter stage of his career. Chandigarh a social utopia, designed as a post-war Garden City, despite the proliferation of the contemporary problems of urban ‘slums’ and ‘squatter’ settlements ranks first in India in the Human Development Index for quality of life and e-readiness. 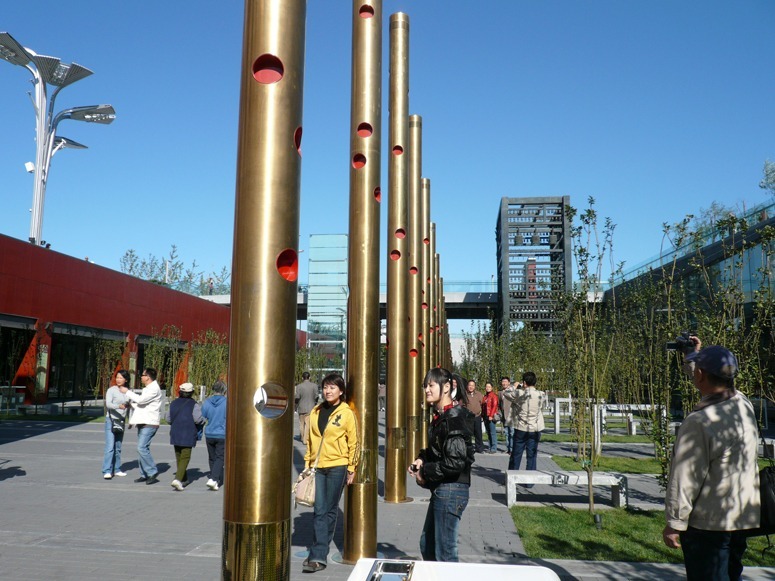 This entry was posted in Asian gardens and landscapes, context-sensitive design, Landscape Architecture, Urban Design on 12th March 2010 by Christine. 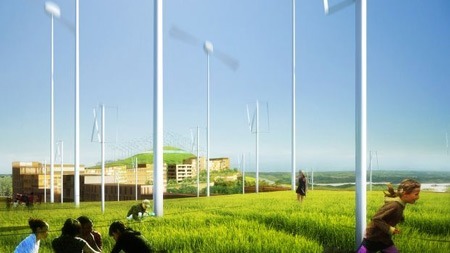 Trying to imagine how the landscape of renewables will look in the future is quite a challenge. Will they be industrial or parklike in character? Or will the have the characteristics of gardens or wilderness places? If the future of alternative energy technology mirrors the evolution of the mobile phone we should look forward to an interesting future. How quickly will the first generation carbon neutral cities become technologically and aesthetically obsolete? When will the classic designs of our zero carbon future become apparent? This entry was posted in context-sensitive design, Garden Design, Landscape Architecture, landscape planning, Sustainable design, Urban Design on 11th March 2010 by Christine. Economic downturns are the coitus interruptus of major landscape and urban planning projects, but they bring unexpected benefits. In the 1970’s many of us lived rent free throughout central London in the empty properties the local authorities had bought up and then not had the money to redevelop. During the 1980’s we gambolled through the derelict wastelands of a half-completed Isle of Dogs in landscapes stuck in a charming time warp between the abandoned Port of London and Canary Wharf. We took our girlfriends up to the forgotten terraces of the old Crystal Palace, where sphinxes emerged from clouds of flowering willowherb. All gone, these buildings and places, they are all designed spaces now, some of them very good indeed, all of them contributing once more to the wealth of the nation. But, what is it about abandoned or fallow projects, half completed places? Where does the romance go when we architects, engineers and landscape architects finally get the go ahead from our clients to finish them off? Perhaps it is just me, but these are the places that I remember the best and miss the most. 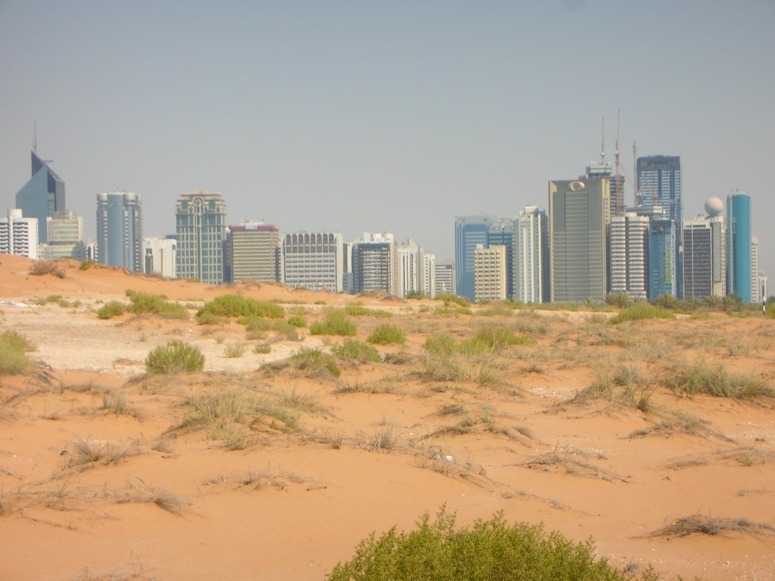 The images show Lulu Island, created at enormous expense off the coast of Abu Dhabi. One day it will be bristling with residential tower blocks and all manner of designed parkland. For now it’s on hold. 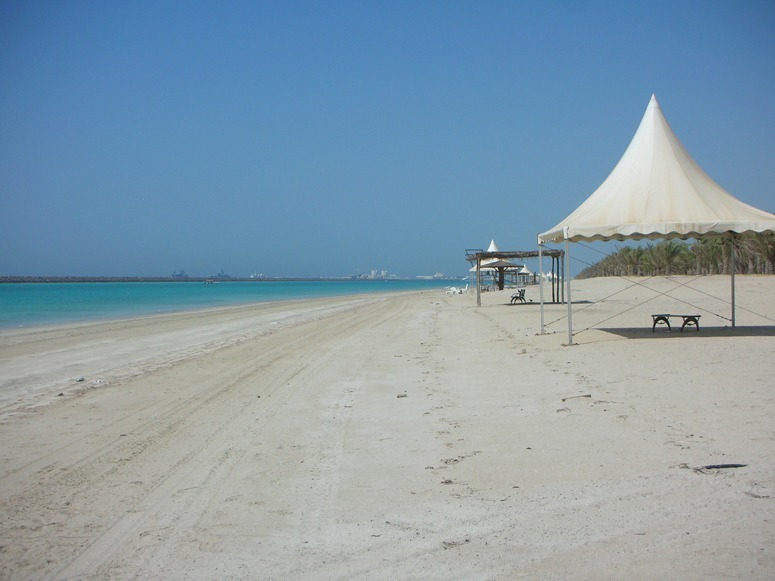 On the eastern side, the best views of Abu Dhabi City, on the western side a 5 km beach whose shade structures are one by one collapsing into the sand. Why do we have to wreck these places with finished projects? This entry was posted in Garden Design on 6th March 2010 by Lawrence. Mahakashyapa became Buddha’s successor. The Sacred Lotus has importance in Buddhism because it grows from murky waters and struggles to raise its pure and beautiful flower into the sunlight, with the lesson that humans should do likewise. Asians thought this was a truth worthy of contemplation – leading to Zen Buddhism. 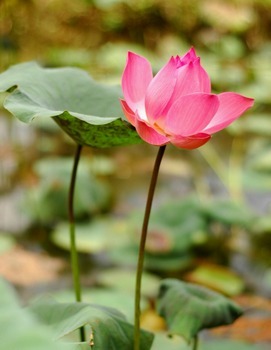 The lotus was also a sacred flower in Ancient Egypt and, probably through the influence of Buddhism, became sacred in China, Japan and South East Asia. Perhaps we will be able to grow the lotus outdoors in London when global warming has gone a little further – but the winter of 2009-10 is not pointing in this direction. Meanwhile, I am wondering if I could rig up a solar panel to keep a tub warm enough for the lotus. But we would need more sunlight for this to work. This entry was posted in Asian gardens and landscapes on 6th March 2010 by Tom Turner. The Altar of Land and Grain (now Zhongshan Park or the Sun Yat-Sen Memorial Park in Bejing) had what western historians call a 'formal' layout. It is neither the garden type nor the design style which features in histories of 'the' Chinese Garden. There is a regrettable tendency for garden historians to write about the Chinese Garden as though it were one thing which was invented about 5000 years ago, which was made for a single purpose and which has never changed. It puts one in mind of Edward Said’s comment on Orientalism (regarding the Middle East). He wrote of “a misrepresentation of some Oriental essence — in which I do not for a moment believe”. We are therefore pleased to publish a classification of Chinese garden types by Xiaomin Wu. 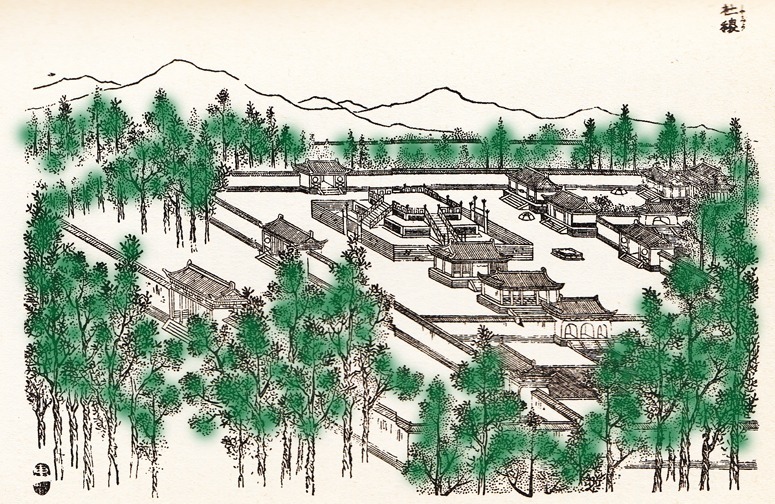 The next stage in developing a systematic history of garden design in China should be to trace the evolution of each of these types through the millennia. This should be done in parallel with studies of the influence of Chinese gardens on neighbouring countries and the influence of neighbouring countries on China. One of the many neglected aspects of Chinese garden history concerns the influence of Buddhism. Maggie Keswick, who wrote by far the most influential western book on Chinese garden history, scarcely mentions the subject. Another puzzling aspect of Chinese garden history is that it is normally studied without reference to Japan or Korea. To me, this is like writing compartmentalised histories of French and Italian gardens or of Italian and English gardens. It should not be done. With regard to China, Japan, India and Korea, part of the explanation is that the countries were not friendly during the twentieth century – American garden historians have considered the influence of Chinese on Japanese gardens, but they have given far more attention to Japan than to China or India or Korea. The Altar of Land and Grain (now Zhongshan Park and the Sun Yat-Sen Memorial in Bejing) (drawing above) had what western garden historians call a ‘formal’ layout’. It is neither ‘the’ garden type nor ‘the’ design style which features in histories of ‘the‘ Chinese Garden. This entry was posted in Asian gardens and landscapes, garden history on 3rd March 2010 by Tom Turner.